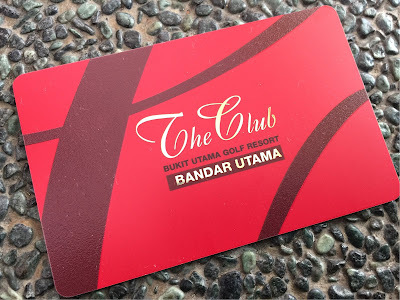 I decided to join The Club, Bandar Utama, as a member of their sports club. For just RM$750 a year, I get access to their gym and their gorgeous, amazing Olympic sized swimming pool, every day, all year round. Parking to the club is free, of course. And I can bring guests - adult is just $11 and $7.50 for kids. This make it the most cost affordable for the girls to be able to practice their swimminf on weekends. The girls are learning to swim and swimming needs practice. They don’t have any avenue to practice. While The Club is opened to public on weekdays, and they do opened up till 10pm, so technically I can bring the girls for their practice on weekdays, it’s just not practical because I only left office at 6.30pm. Being a member, I can bring them for a dip during weekends. And we tried that last weekend. I can tell that being able to “play” creates a lot of self confidence in them to be comfortable in water. When they have their lessons, that's not play. That’s listening strictly to teacher and performing to a certain expectations. When playing, it’s all fun and being able to swim as they play just made playing in water extremely joyful. Not only that. While they are having their one hour lesson, I could just go for a quick 30 min lap as a form of exercise. This is a great motivation for me to get some workout. I have access to gym and I’m even thinking of asking my friend to go for a once a week gym session with me. Lastly, I wanted to kick myself for not joining as club member earlier - as a member, we get 10% off in house lessons. I’m already paying $330/month for both girls’ swimming lesson. 10% less means $33 savings which is half the monthly price of membership! It’s almost a no brainer to be a member if you have two kids taking swimming lessons there! Duh! If you are already a One Card holder with season parking, they combined everything into just one card, which is smart.